Man oh man... I can't for the life of me figure out where the time goes and how fast it flies by!! I've been a bad girl and haven't posted to my blog in several weeks...eeeeekkk... NOT GOOD! Let's see .. there is the blog, on-line emails, facebook, thank Heavens I'm not on twitter and so many of the other publications... I can't keep up!! Here's what's been happening... I've been packing the house. My husband has retired (say a prayer for both of us... we have no tbeen together 24-7 our entire marriage.... scary... very scary) and we have decided to move to a more efficient house. We found one here in Jacksonville that has a gorgeous energy efficient kitchen, small yard (mine is BIG) that we can take care of instead of paying someone to mow my grass and take care of the yard that I probably haven't walked in more than a dozen times in 11 years... all brick, new roof... and the best part... I get a HUGE sewing studio. It's so pretty and bright.. love it! As soon as we are in and decorated I'll pass on some photos to you. So in between packing, keeping my husband busy, and trying to design and sew... the time has just escaped me. Vicky is piecing my samples (love you sis!) as fast as I have them designed and the fabric chosen. Talking about fabric... I packed my double door closet (huge linen closet) and my walk-in closet with all of my fabrics, kits, projects, etc.... well do I need to say... OMG!!!! 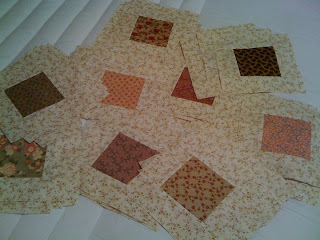 I can design 15,000 quilts and will not have to buy one stitch of fabric to make the sample. Of course you and I both know that's a big ball-faced story... ha! This is a new sample for "Princess Charming" that Vicky designed several years ago. The colors are so much prettier than this picture shows. I can't wait to see it when it's finished. I'm trying to design patterns that are easier and those that are a little more challenging. This is EASY, fast and can be great fun. I've seen it done in batiks and Kaffe Fassett fabric and it's so cool. Pretty Pots A Plenty is now finished at the quilters and Vicky is in the process of binding this sweet thing! 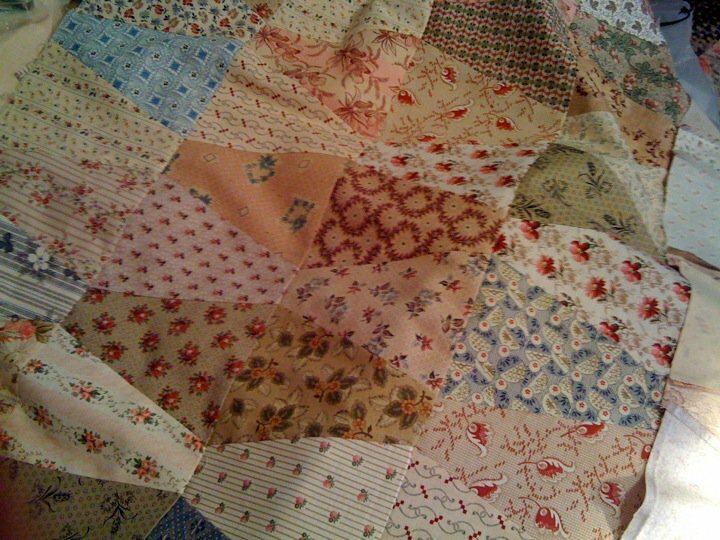 I love this quilt... it reminds me of an old fashioned quilt that is on top of a big thick feather down mattress... you hop in bed, sink into the mattress and cover up with this luscious thing... aaahhh... doesn't that sound wonderful? I'm currently piecing two new quilts... "Flight of the Sparrows" and "Southern Gathering" Block of the Month. I'm so excited to get them finished... first to see how they look all together and second... I'm ready to move on to a new project and/or design. My next project is going to be a bed runner... you know... the kind they have in the hotels.. that lies at the food of your bed for decor. Actually... they have those on the bed for you to place your suitcase on to empty... that way the coverlet stays clean longer... kind of like when you unpack on the cruise ships. I'm making mine with wool applique.. and there better be NO SUITCASES placed on it!! I'll post a sketch of the design when I get to that point. I'm off to sew... yippee!!! Have a happy day and remember... "Celebrate Handmade"!